This book presents a unique collection of the most relevant perspectives in contemporary human rights philosophy. Different intellectual traditions are brought together to explore some of the core postmodern issues challenging standard justifications. Widely accessible also to non experts, contributions aim at opening new perspectives on the state of the art of the philosophy of human rights. This makes this book particularly suitable to human rights experts as well as master and doctoral students. 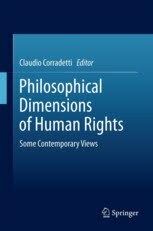 Further, while conceived in a uniform and homogeneous way, the book is internally organized around three central themes: an introduction to theories of rights and their relation to values; a set of contributions presenting some of the most influential contemporary strategies; and finally a number of articles evaluating those empirical challenges springing from the implementation of human rights. This specific set-up of the book provides readers with a stimulating presentation of a growing and interconnecting number of problems that post-natural law theories face today.